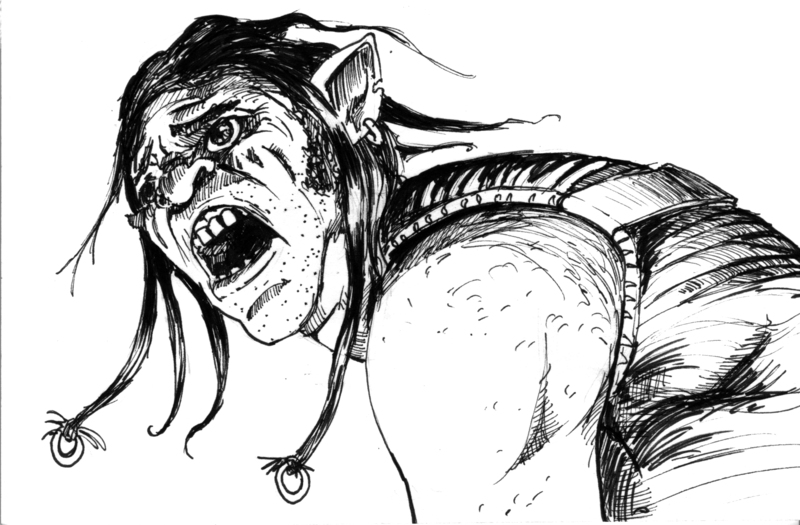 How to screw up Races in AD&D! 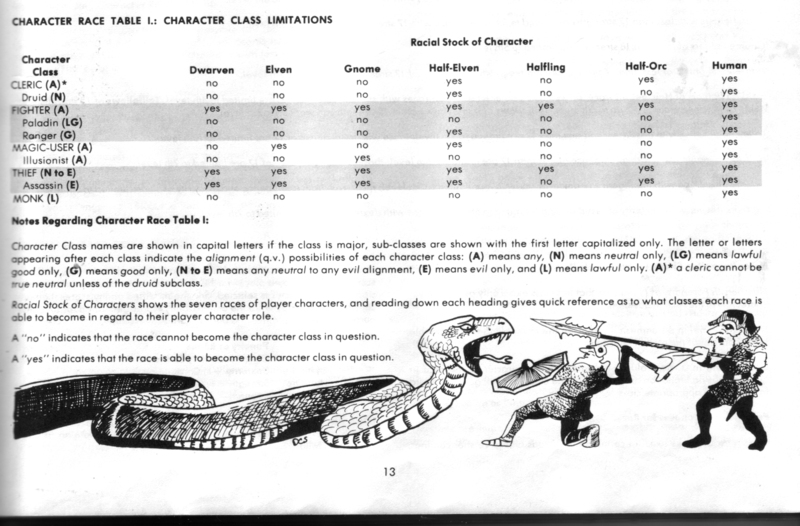 Race in AD&D seems like a pretty straight forward thing, but when was the last time you looked at the charts? Fail Squad Games Gamers have been screwing this up for a long time. It ‘s time to take a closer look at race. One of the beautiful things about AD&D was the mechanical balance. Many newer gamers don’t care for the restrictions, but it is these restrictions that keeps much of the strategy and cooperation in the game. Unfortunately, it’s the Racial limits and restrictions that often get house ruled, glazed over, or forgotten. Another thing of beauty regarding the AD&D books is they walk a player through character creation chronologically and logically. First came the Stats, and now choose a race, then a class. Let’s take a look at what race is in game terms. Unlike our real world which defines this by skin color, AD&D uses a clearer distinction, and perhaps a more proper one. After a player has determined the abilities of their character, it is then time to decide of what racial stock the character is to be. For purposes of the game the racial stocks are limited to the following: dwarven, elven, gnome,half-elven, halfling, half-orc, and human. In later books a wider selection would be allowed, and in Unearthed Arcana (Considered AD&D 1.5) many restrictions were eased. Your DM should decide if they are going to use UA and Dungeoneer’s Survival Guide when starting a game. Many of these restrictions and reasons for them are peppered throughout the text, they are simply summed up conveniently on Page 13. Let’s take a look at the story we are being told and how it often gets mis-used or house-ruled. Classes in CAPS are major classes (Fighter, Magicuser, Cleric, Thief (Monk). lowercase classes are sub-classes. The letters in the parenthesis are alignment restrictions. This table has A LOT of information coming at you all at once. Yes or No indicates if it is allowed. Classes in CAPS are major classes (Fighter, Magicuser, Cleric, Thief (Monk). lowercase classes are sub-classes. A number indicates the greatest level that character can attain, U is unlimited, and (Where we screwed things up), numbers in a parenthesis means that is the maximum level possible but it is ONLY allowed for NPCs. That’s right, Humans clearly dominate the ‘known world’ in religion (and other professions). There were no Dwarf, Elf, Gnome Clerics that were player characters. No Halfling Clerics. Half-orcs can only reach level 4 and half-elves level 5 in Cleric, while humans are unlimited in their holy power across the board. Furthermore, many of these maximum limits are only the maximum if the character has an exceptional prime requisite. To House Rule or Not? That may have been exactly Gary Gygax’s point. Humans have a bonus and a benefit; unlimited power. But frequently complaining players and DMs desperate for a happy table, acquiesce and over-rule racial level limits and others. Has anyone tried the game enforcing the rules as written? It seems like a broken and restricted thing, but it retains a firm balance. Let’s not forget there are half-orc bonuses, infravision and more. Yes they may be limited to level 4 cleric, but they can be a Fighter/Cleric. A level 8 half-elven wizard is still a being of power in the game, if it is not heavily adjusted. I have found myself DMming games that had power rapidly spinning out of my control and I didn’t know why. Much of it was because I allowed these balancing restrictions to be lifted. The end result at mid to higher levels was the game stopped being fun. The Fail Squad Games advice would likely be to house rule these limits with caution, and try the game with them for a while before discussing alterations with the group. Allow an opportunity to re-visit the house-rule later if you feel it slipping out of control and want to rescind it. There is a third racial table that follows and it illustrates the limits and minimum stats required to play the various races. Much of this was covered in previous articles on Strength, Intelligence, Wisdom, Dexterity, Constitution, Charisma, and Comeliness. I think this is where our friend Gary Gygax succeeds every time. It’s the one you want to play! AD&D has a definite game strategy and mechanic balance. A successful party has at least one of each class, and perhaps an extra race sprinkled in on occasion. With Modules like Tomb of Horrors, living forever was never guaranteed, and chances are, you would get to play another character pretty soon anyway. Do you house rule racial level and ability limits? 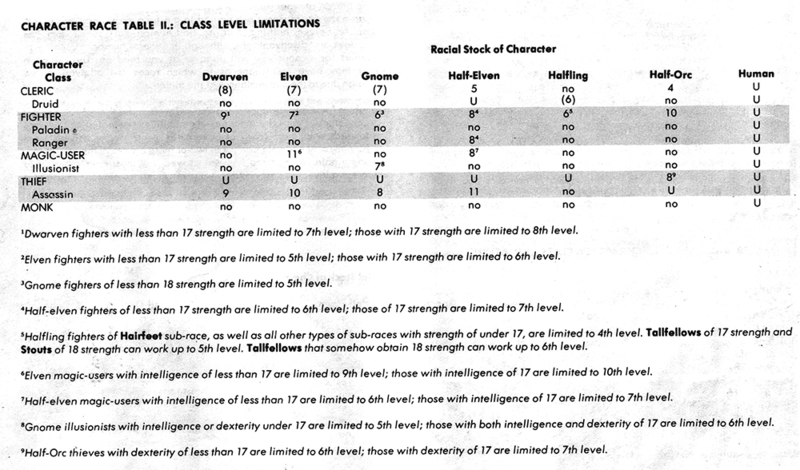 In B/X, IIRC halflings were limited to level 8, elves to 10 and dwarfs to 12 (or maybe 4/6/8?). That was a bit of a deal-breaker for my players. I agree. It has always been a sticky point for most gamers. It may be the most extensively house-ruled thing in the game. We used the Class / Race limits for 2nd ed. (which we played and modded 1st ed stuff for) but we also used the bonus levels for high prime scores. There is short term gain and long term gain. I have a love/hate relationship with the racial system, but you are right, it has to be in place for the game to function long term. It doesn’t always make logical sense, especially if you want more of a Tolkien feel. We have tinkered with solutions. It isn’t all perfect, but it’s a good stab at it for the first game of its’ kind. I always took racial level limits as a status of events. Meaning that once you reached that level limit it too twice as much XP & training time to get to the new level. Once that a given race’s class reached a new level the level limit for that race was raised by one. So while most campaigns did not last long enough to make these changes several did and as of this minute PCs can be Lizard Men Magic-users up to level 5, Gnomes can be Monks up to level 4 and Elves have gained two levels in Magic-user. I always wince when I see young players come to a con and show me thier 2E character sheet with their 29th level – whatever. I play 1e to this day and except for letting all races be allowed to chose cleric (why have Demi-human and Humanoid gods, then? ), I follow the tables/limitations closely. That is a very valid question. I suppose there are plenty of folks in the world who pray to various gods without becoming clerics though. In 1e it’s tough to survive into that range. There’s a lot of save or die rolls! To keep a balance in the game as intended but also not have the human players run away in HP and other “perks” I instituted a rule by which the non-human experience points were halved up to the maximum obtainable level with a good prime requisite. After that their experience points were then quartered. This made it seem as if the unobtainable was, eventually, obtainable and retained the original balance intended by the designer (EGG). At the same time it appeased the player that they were not going to be stuck with a level 4 1/2 orc cleric forever (instead they would top out at level 6 when everyone else was 8 to 12). I found this solution worked without the above mentioned “spiraling out of control” power imbalance. After playing and talking with the old school guys a while, I get the impression that even getting beyond level 8-10 was pretty rare.